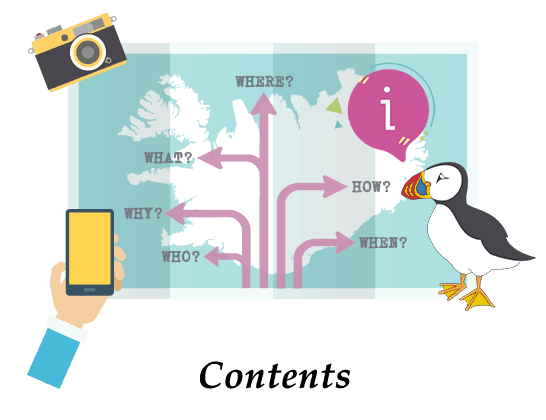 In this special practical travel guide I will show you all the important and essential information you need while travelling in Iceland. Before heading to a new country it’s important to know how things work. Many travelers tend to spend a lot of time gathering bits and pieces of information from various corners of the Internet. It’s a time consuming process and sometimes hard to find the correct facts. For travelers to Iceland, this problem is no more. In this guide I have done all the research for you. It includes all the most practical and authoritative information you need to know. The guide includes weather information, daylight hours, road conditions, public transportation, maps, as well as important phone numbers, banks, post offices, shopping areas and official websites. Everything in one place. Be sure to read it through for some bonus info in the end. 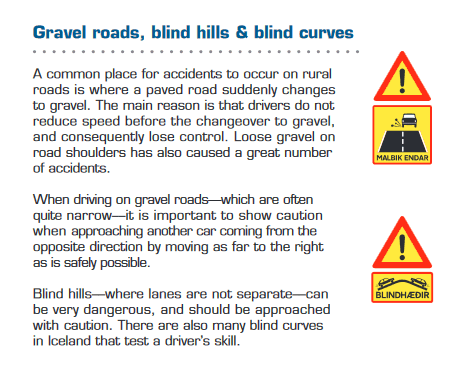 If you want to read this guide later or keep it with you at all times on your travels you can download it as an eBook (PDF) – Click here to Download. Click on each chapter to jump directly to it. The weather in Iceland can sometimes bring a lot of surprises and have a big impact on your trip. Extremely bad weather can cause parts of the road to be closed or certain travel activities be cancelled. The short description is; it’s unpredictable. It can be windy, rainy, cold, sunny and calm, sometimes almost all at the same time! 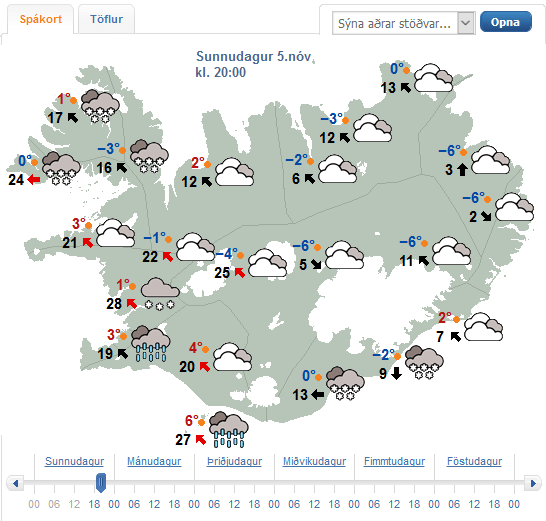 Icelanders have a joke that describes this well: “If you don’t like the weather now, just wait for five minutes”. The scary thing is that it’s actually quite true! Therefore, it’s very important to follow the weather forecast during your stay so that you can be well prepared before you begin your journey in the morning, or start planning outdoor activities. The weather also plays a key role in whether you can witness the Northern Lights or not. Below you will find the essential Icelandic weather forecast websites, these are what the locals use. I also added Northern Lights forecasts and other practical information related to the Icelandic climate. 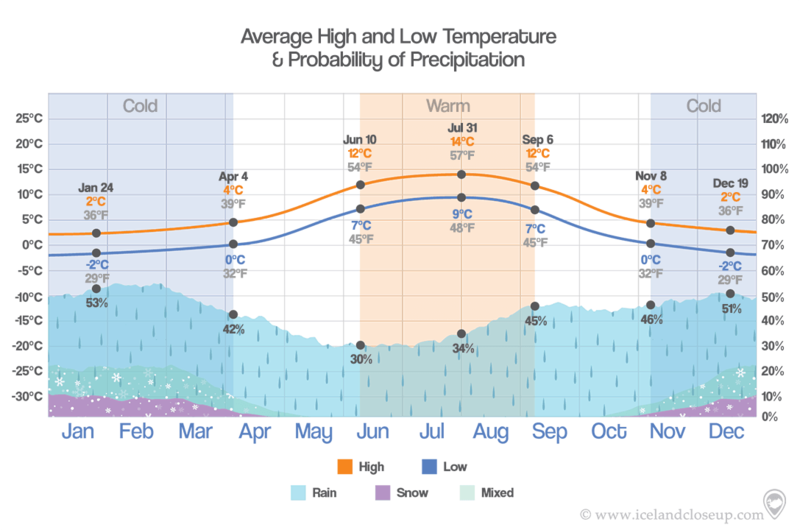 Four seasons, each season’s average temperature and precipitation. Click the image to make it larger. 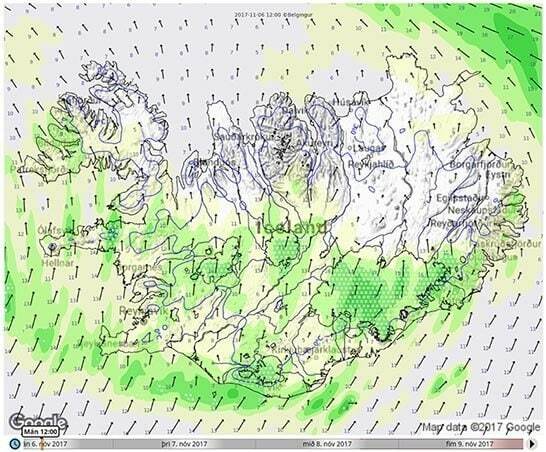 The official weather forecast, from the Icelandic Meteorological Office. It’s an interactive map showing the weather report for today and this week, by the hour. You can split it into locations or read the forecast as text. Other forecasts are also available, for example on earthquakes, avalanches or hydrology. A free weather app is available from the Meteorological Office. If it installs in Icelandic you can go into the menu under “Stillingar” and select English as a language. Belgingur also provides a very accurate weather forecast for the next three days. Its accuracy provides forecasting for the global wind energy and emergency rescue sectors and enables its users to better anticipate changing weather conditions. 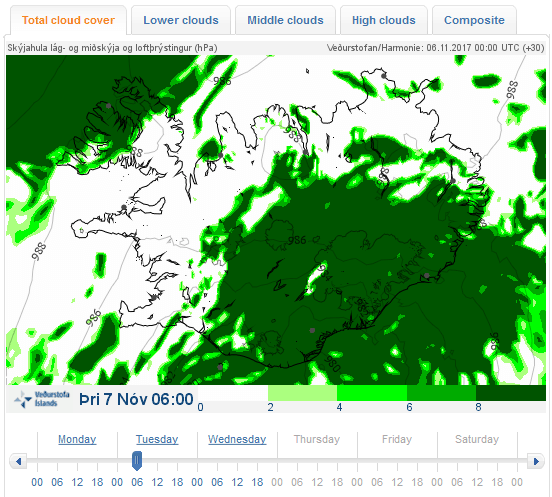 This aurora forecast is part of the Icelandic Meteorological website. 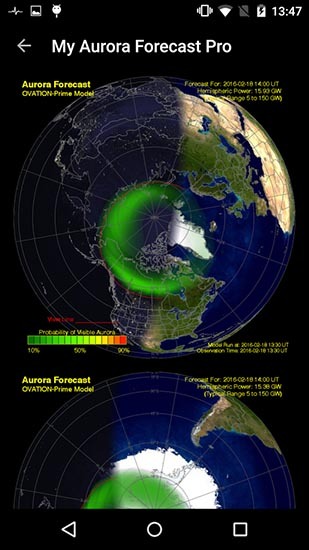 It shows the aurora forecast for the next three days. In the top right corner you can see aurora activity measured in numbers from 0 to 9. Higher numbers mean more activity. A green color on the map means possible cloud cover. The darker the green, the more clouds are blocking the view of the Northern Lights. 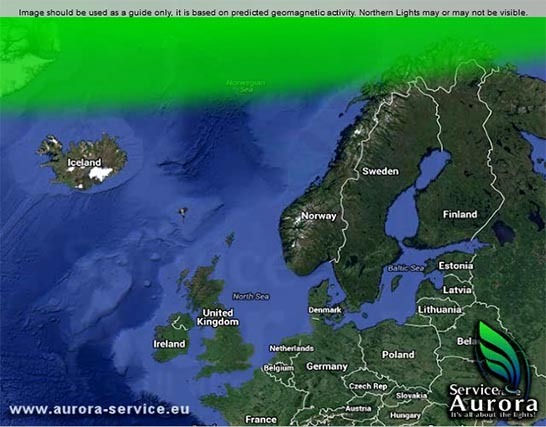 Another great aurora forecast website showing the whole of northern Europe. Here you can see an hourly as well as a three-day forecast, along with a lot of more detailed information for enthusiasts. A handy app that helps you to chase the Northern lights using your phone or tablet. Iceland is located next to the Arctic Circle, that makes the daylight length quite different in summer compared to winter. June and July is when the daylight hours reach their maximum, that’s the time of year to experience the midnight sun. 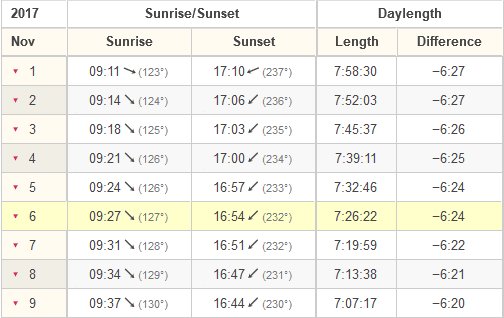 Even though the sun ducks behind the horizon for about three hours the daylight will stay for 24 hours. In December and January, you will experience the extreme opposite, the days become much shorter, with only about four to five hours of daylight, which means you will face more darkness. But the good thing is that you have a better chance of seeing the Northern Lights, since they can only be seen in the darkness of a clear night sky. So when is there 24 hour daylight and when is the best time to see the Northern Lights? Explore the resources below so you can make a good travel plan, and so that you don’t miss out on the items on your bucket list. 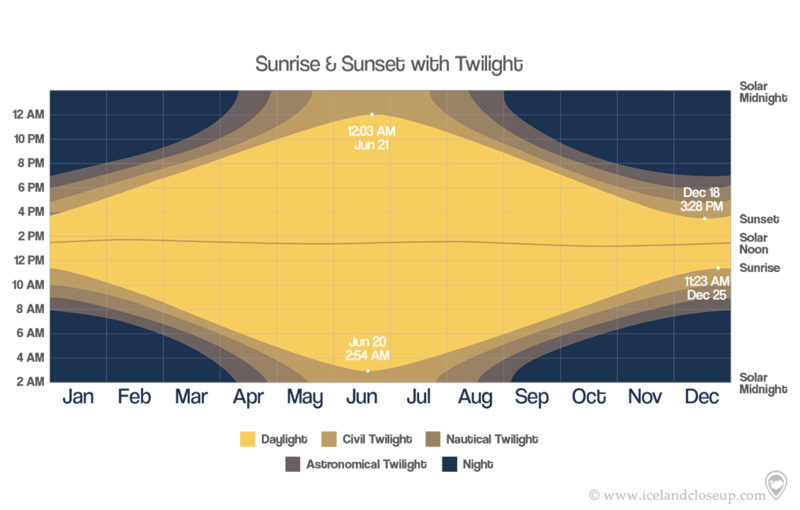 As a general guide, this is an image analysis of each month’s daylight hours throughout the year. Click the image to make it larger. 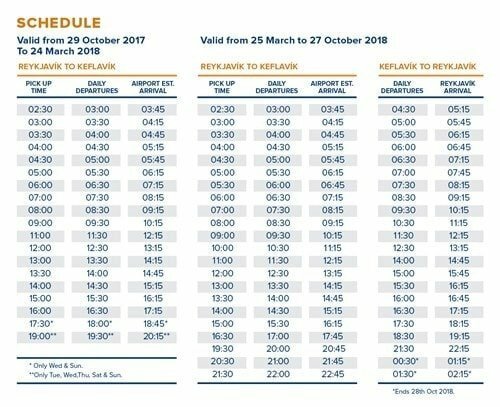 Here you can check the timetable of sunrise and sunset at various locations in Iceland, including day length, present time and date etc. It is good to keep in mind that Iceland does not adjust to daylight saving time. If you haven’t experienced the midnight sun in Iceland, or your trip happens to be in winter, then you might want to read this article and watch the video to see how it is during the midnight sun season. Many tourists prefer to drive around the country by themselves. It’s understandable, the scenery on the road is absolutely no less impressive than any of the more famous attractions. The magnificent landscape makes you feel like you are on another planet. Because of the unique terrain, drivers can get into some difficult circumstances that rarely come up in other countries. So before you start your self-drive tour in Iceland, it’s crucial to know the road conditions, the weather, and, of course, the driving rules, so that you will have a safe and pleasant trip. Here are the official resources for the most essential road conditions and safe driving information. Constantly updated information about road conditions and weather from the Icelandic Road and Coastal Administration. You can call 1777 to get more detailed information in English as well. They also have a very good mobile app where you can see most of the information presented on the website. Such as road conditions, road webcams and weather. You can also enter your starting location and where you are going and the app shows you the road conditions for your journey. It’s available in four languages, English, Icelandic, Italian and Polish. The Icelandic Association for Search and Rescue is an official source for safe travel in Iceland. If there are any official alerts that you should be aware of you can find them here. You can also leave your personal information and travel plan with them, in case something happens during your trip. For extra safety you can download their mobile app. Inside the app just press the red Emergency button to call for help and the app sends your location via text message to the 112 response center. The green Check In button is to leave your location with them, so that if something happens they have more information to work with. If you have looked at the weather forecast and road conditions but you are still not entirely sure how safe the roads are, you can check this map to find a live webcam close to the area you are going. It might give you a more realistic view of things. 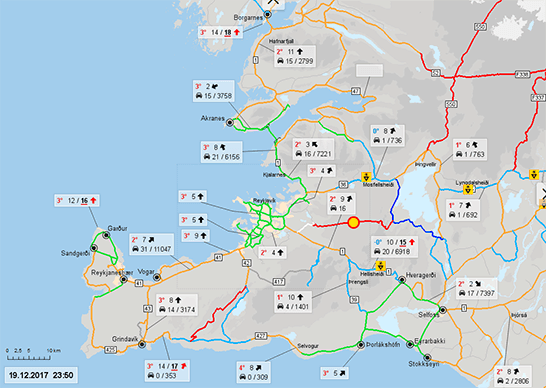 On the map you can also easily see which roads are paved and which are gravel, because not all roads in Iceland are paved. 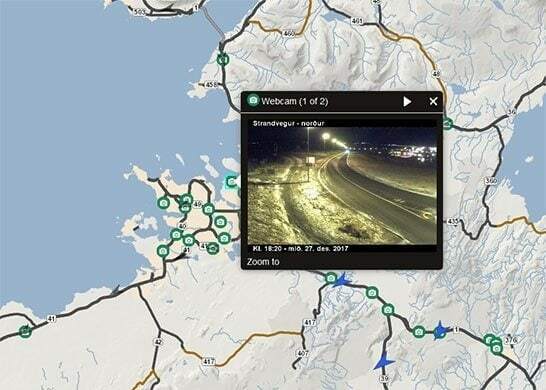 You can also see the webcams inside the Icelandic Road and Coastal Administration mobile app. 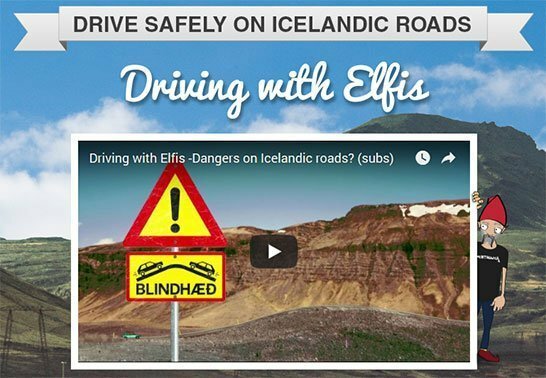 Interesting instruction videos about how to drive in Iceland, along with important driving rules and tips from the Icelandic Transport Authority. Other detailed information about driving in Iceland can be found here, along with a PDF brochure that we highly recommended every self-driving tourist reads. Traffic signs are an important part of safe driving. Some Icelandic signs are unique and knowing them can be essential. 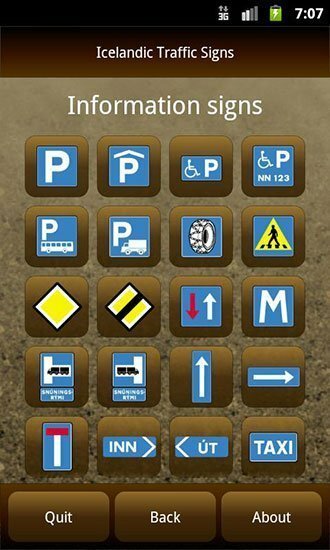 Download this handy app to get to know the traffic signs used in Iceland. The app works offline as well as online. Unfortunately it’s only available for Android devices. One of the most essential tools every tourist needs is a map – especially first timers. A map is required regardless of whether you’re on a self-drive tour or searching for a hidden hot spring out in the wild nature. With the help of technology, online maps are the most helpful tools to find our way. It’s always good to get yourself well prepared before your trip. Here are the six main online maps that you can use for planning your trip or find locations. Many of them have similar functions but some are quite unique. Google Maps is a widely used online tool. Here you can find most places and locations in Iceland along with pictures of them, taken by real tourists or locals. The only inconvenience is that you can only download one area at a time for offline use, not the whole country. By using Google My Maps you can customize and personalize your own itineraries. Excellent choice for those who don’t have a large data plan while in Iceland. 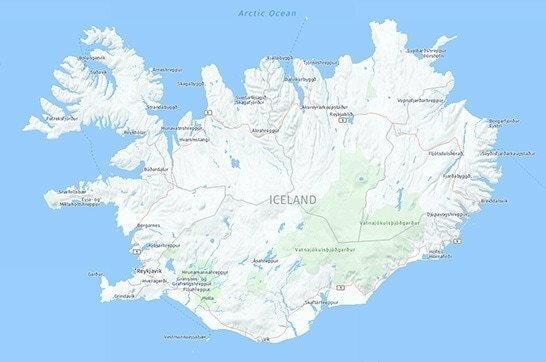 You can download the whole Iceland map while on a Wi-Fi and use the full map offline, so you never have to worry about eating up your data plan during your trip. 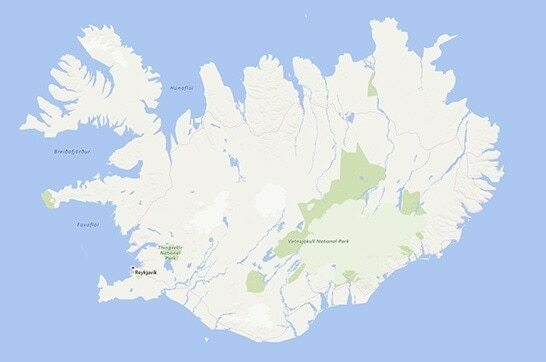 The map of Iceland is also very accurate. Bing Maps is another online mapping service which is quite similar to Google Maps. It doesn’t offer an offline solution so you need to be connected. It uses data from Here WeGo maps among others to provide their services. So if you want a mobile version we suggest you download the Here WeGo app above. Já is an Icelandic service company (já means yes). 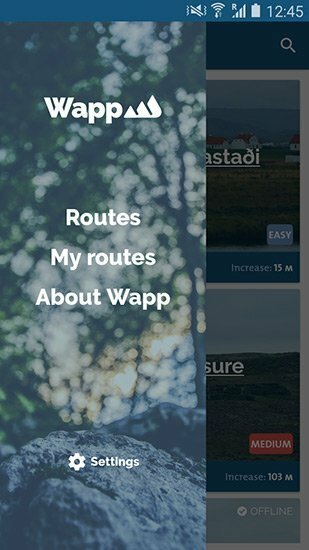 Because it’s operated in Iceland the Já map brings you more detailed information about locations than the other maps; for example horse trails, private trails and many hiking trails. It also has a street view option and a directions guide. Extra features include searching for addresses, phone numbers and other local information. The Já mobile app is mostly for searching phone numbers and addresses, but once you’ve searched for something you can see a map of the location and get directions. 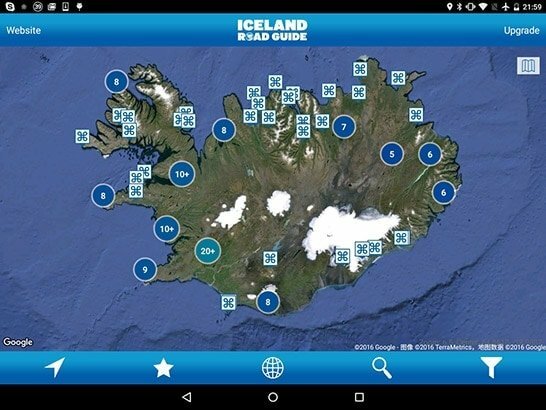 This app is a map of Iceland which includes information about all kinds of interesting places. Unfortunately there are only 300 places in the free version but if you upgrade for around €11.99 you get all the content. You can download it in the App Store for iOS devices or in the Google Play Store for Android. 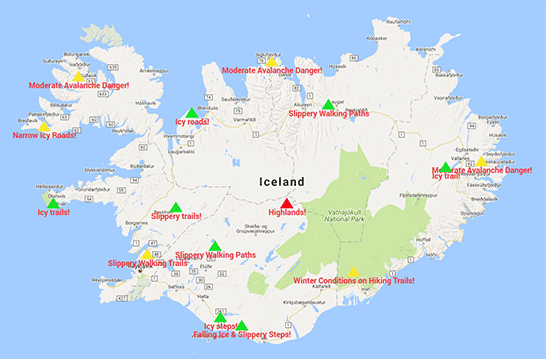 An excellent app with a collection of GPS tracks for trekking in Iceland. For each track it features various information on nature, history, folk tales and the environment. Not all tracks are free, some cost a small amount but they are combined with a detailed map, and you can download the tracks to use offline as well as online. While you are travelling around Iceland, we want you to be safe and sound. Since the tourism industry in Iceland has grown massively in the past few years, the mishaps have also increased. So if something happens to you during your trip, you must know how to call for help. Iceland has excellent emergency and rescue services. Health care facilities are also very advanced. It’s important to know the fastest and most efficient way to ask for help in various situations. Here is a list of all the important phone numbers you can call for emergency circumstances during your stay in Iceland. Be sure to save these numbers in your phone and download the 112 Safetravel app. 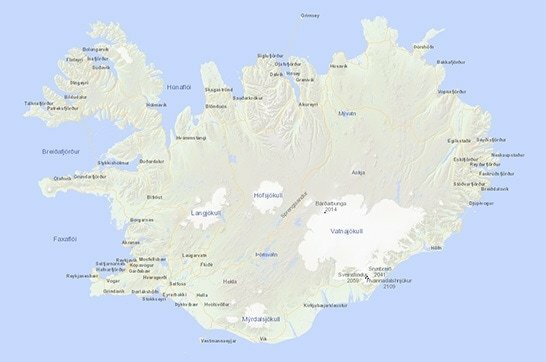 The Icelandic Association for Search and Rescue is an official source for safe travel in Iceland. 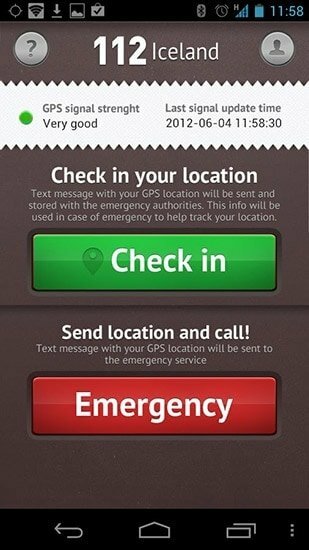 Inside the app you can press the red Emergency button to call for help. Then the app sends your location via text message to the 112 response center. The green Check In button is for leaving your location details with them so if something happens they have more information to work with. This is the Icelandic online phonebook. You can search all registered telephone and mobile numbers, both personal and business, along with their addresses. Já also has a map service tied to the phonebook so you can get directions and see street views of the addresses you’re searching for. Public transportation plays a big role if you want to travel on your own around Iceland, especially if you are not renting a car. For planning your trip itineraries and time schedules you must know how to use it and where to search for all the information. We have gathered all the domestic public transportation information into one place, from city transportation to domestic airlines and ferries. 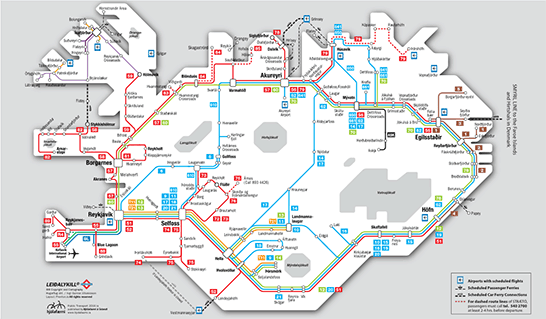 You can check the maps, timetables, schedules, plan your trips and get other information. Detailed information with an attached PDF document of domestic public transportation for the whole country. A list of ferry lines that provide transfers to islands, and over fjords. Hrísey is a beautiful island located in Eyjafjörður fjord, in the north, on the same fjord as Akureyri. The Hrísey ferry sails very frequently all year around. 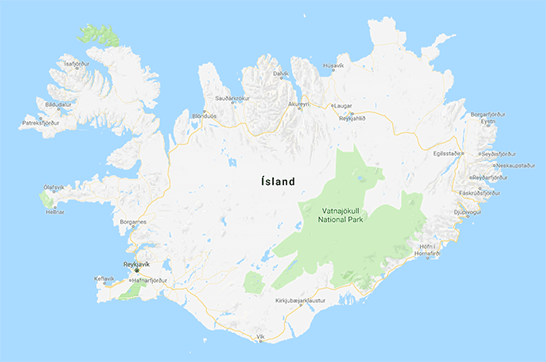 Grímsey is the northernmost inhabited island in Iceland. The Arctic Circle runs through the middle of it and it’s especially popular to step into the Circle. Grímsey Ferry sails both to Grímsey and Hrísey all year around. These two tour operators conduct scheduled trips to various places on the Hornstrandir Nature Reserve. Hornstrandir is well known for its isolation and breathtaking landscape and cliffs. Anný, a small cargo and passenger boat sails between Neskaupsstaður and Mjóifjörður in east Iceland during the winter. 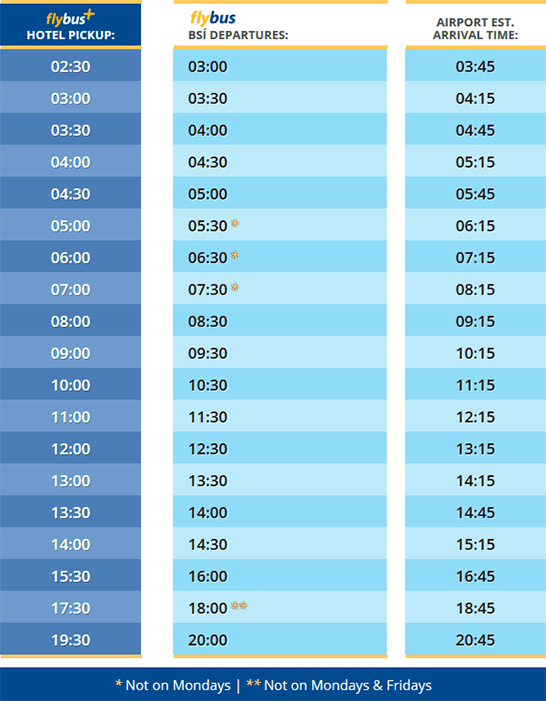 Below is the schedule, and for more information you can call: +354 853 3004 or +354 616 2630. 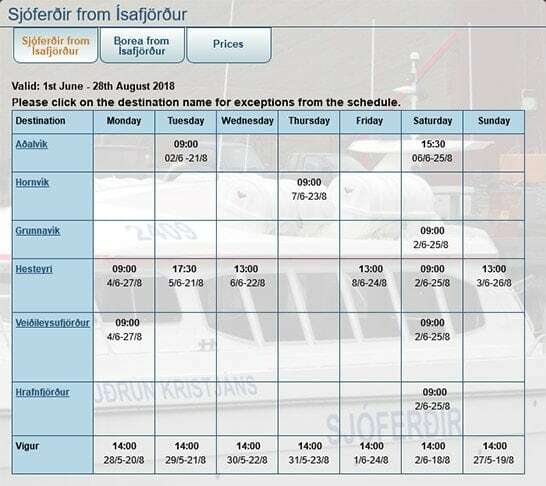 If passengers wish the ferry can stay longer in Mjóifjörður, to maybe 14:00. 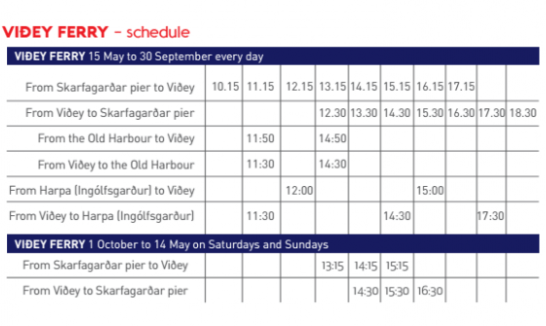 Please note that the ferry is small and transports passangers only (no cars). The public bus transportation in Iceland is called Strætó. On their website you can check timetables, routes, plan your trips and check a map with a live location of each bus. It should be noted that Strætó inside Akureyri is free of charge. You can also download the Strætó App for mobile phones. Besides all the functions that are provided on the website, you can also book your tickets in advance. It’s available in English, Danish and Polish. These are the two main airport shuttle services. Note, Strætó (above) also operates from Keflavík International Airport. 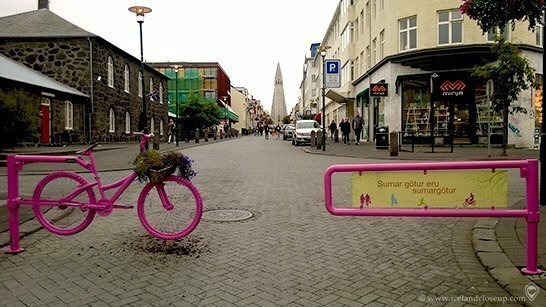 If you’re tired of walking you can rent a bicycle to explore downtown Reykjavík. 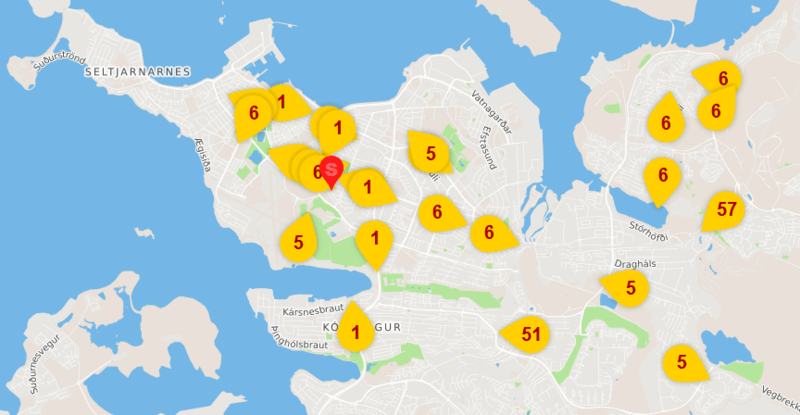 WOWcitybike stations are located in various places around downtown Reykjavík. 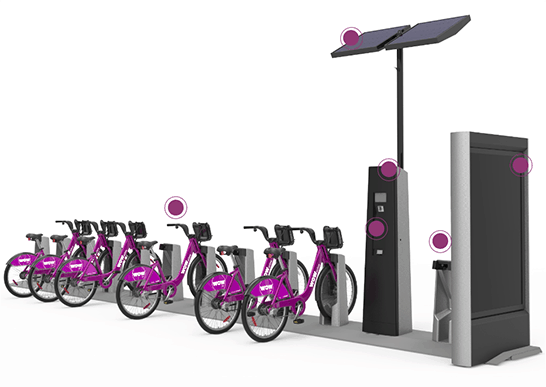 You can rent a bike for up to 30 minutes and return it to any station. The rentals include two mobile apps to help you use their system. Transit App helps you to plan your next trip, to view number of available bikes and docks, to get directions and an approximate trip time, along with buying a daily pass. Cyclefinder App provides information on the number of available bikes and docks, and a timer which alerts you when you have five minutes remaining on your trip. Reykjavík bike tours have a wide selection of bicycles for rent inside of Reykjavík. They also offer guided bike tours around the city as well as Segway tours. 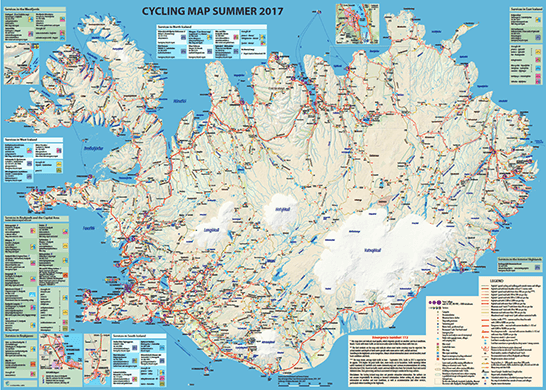 Here are extremely helpful maps for bicycle routes in various areas from cyclingiceland.is. Note these are PDF maps. Here in Iceland we don’t hail a taxi, except in special taxi parking locations downtown Reykjavík. They are clearly marked with a taxi sign. The main method is to make a phone call to one of the taxi companies, or use their mobile app, and have them pick you up where you are. Below are the two main taxi companies you can call. Both of them have a free mobile app. A trip to Iceland can be absolutely worth spending your money on, whether it’s a tour, a service or a product. But before you make your purchase, you probably want to know the price in your native currency. For some tourists, the number of digits on an Icelandic krona price tag can look like a lot of money. 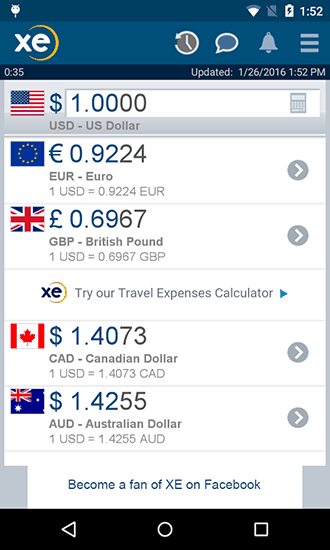 After you convert the amount to your own currency you will find out that maybe it’s not as expensive as first appears. Below are exchange rates from all the local banks, including the official rate from the Central Bank of Iceland. Official exchange rate from all the major banks in Iceland, including the Central Bank of Iceland. Handy app for mobile and tablet devices. The Iceland Post is the official post office in Iceland. It offers a variety of services. Apart from sending and delivering letters and parcels it’s the best place to buy stamps if you want to send some postcards. 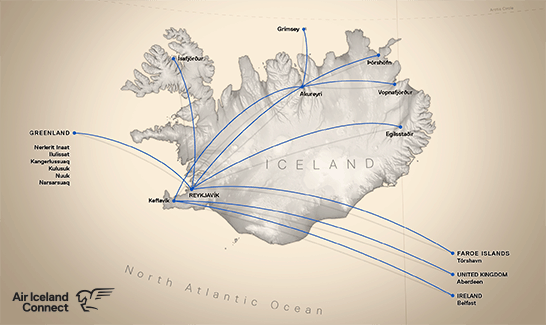 Post offices in Iceland are located in more than 70 towns throughout the country. There are three main shopping areas inside Reykjavík Capital Area. One is the shopping street in downtown Reykjavík called Laugavegur. It includes a variety of shops which range from high fashion to dollar shops, from fine furnishing to kitchen gadgets. Many restaurants, coffee shops, bars and bakeries are also in the area. This is where the Reykjavík nightlife happens. For shopping malls, the Reykjavík Capital area has two main shopping centers. Kringlan and Smáralind. 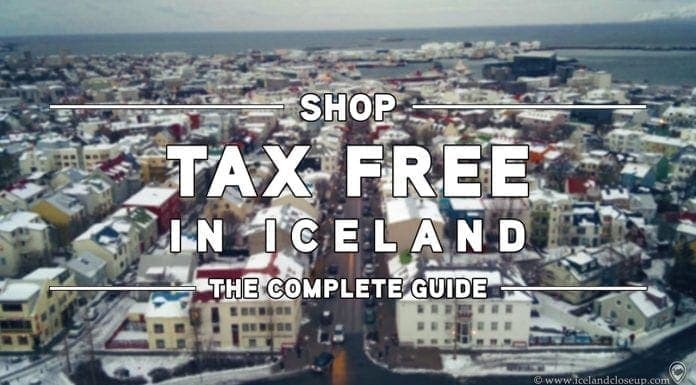 Shopping tax-free in Iceland is possible. It helps you to save a decent amount of money by declaring it at the airport when you depart from Iceland. Check the article below for a more detailed information. The downtown area consists of a few key places in addition to Laugavegur: Skólavörðustígur, the street leading up to Hallgrímskirkja, Lækjartorg and Ingólfstorg, two squares leading to Laugavegur, Tjörnin, the pond, Harpa music hall, and the old harbor. Kringlan is easy to reach either by bus or by car; it’s about a 10-minute ride from downtown. In summer there is a free shuttle bus that departs from the tourist information at City Hall every hour during opening hours. Smáralind is located in Kópavogur, which is a town connected to Reykjavík. It takes around 15 minutes to drive there from downtown Reykjavík. Smáralind also offers a free shuttle bus from downtown Reykjavík in the summertime. Nothing is more exciting than exploring Iceland’s wonderful and unique landscape. There are so many outdoor adventures to select from. You can see unique landforms, active volcanoes, powerful geothermal geysers and the magical Northern Lights. It’s a true paradise for nature-loving people. The local people and the Icelandic culture are no less impressive than the nature. Icelandic cuisine and music are, for example, big attractions for tourists, from various seafood to self-grown vegetables, from worldwide-known music festivals to mainstream local musicians. Iceland always tries to give you the best it has to offer. Here are links to all the official “what to do” websites, one for each part of the country. There you can get detailed information about what can be experienced in Iceland. A super handy 1-3 day pass to almost all that Reykjavík has to offer. 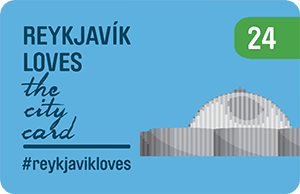 It includes free entry to Viðey ferry, Reykjavík City Bus (Strætó), swimming pools and a lot of museums. As well as discounts in shops, restaurants and other activities. Phew, that’s a lot of information! Remember to bookmark the page so you won’t lose it! If you are still thirsty for more, other articles on our website, icelandcloseup.com, also provide lots of good and practical information. Be sure to follow us on Facebook, Twitter and Instagram. And please, leave us a comment below and tell us what you think of this guide! If you know someone who’s coming to Iceland, let them know about this article, it might help them a lot! AMAZING resource for anyone interested in visiting Iceland. I hope to in the next year or two and this is a must-have for me to keep. As a photographer the information about sunrise, sunset and northern lights in much appreciated! Thank you so much! Really glad to hear that it can be of use to you. This is great! Thanks for putting this all together! Thank you! I’m glad you liked it. Hope it can be useful. Can you tell us the best way to stay at an affordable Hotel just with Wifi and basic services? Moreover, what are the food option for vegetarians? Please pour some light on this too! Wow, you have actually provided a lot of information. I wanted information about shopping mall in reykjavik but have given a lot more information so thanks a lot. Incredibly comprehensive! I love the option to download it. A lot of this is stuff I’ve seen before, but this is perfectly packaged all in one place. Great work! Thanks you for sharing!